Does Your Horse Need a Dentist? 17 May Does Your Horse Need a Dentist? Does your trusty mount “eat like a horse” but still lose weight? Does he slobber his grain all over the ground? Does the bit irritate his mouth? Then he may well need some equine dentistry! A healthy mouth is crucial to the condition and well being of a horse. Equines are like most of the grazers of the earth: they have very long grinding teeth embedded in their gums that slowly grow down into the mouth as they are worn away by the constant chewing of grass or hay. The wear pattern is not always even, so sharp points, hooks, or uneven alignment often occurs. This makes it difficult for the horse to chew properly and can cause sores on the cheeks, gums or tongue. If their teeth don’t grind up the feed into small enough pieces, the feed often cannot be digested properly. Painful abdominal problems called “colic” can follow, which can be potentially fatal. Weight loss and poor body and coat condition can also result from tooth problems. A veterinary dental exam checks for many tooth problems. Mild uneven teeth can be “floated” or rasped smooth by special instruments called “dental floats” which is called a “dental balance”. If the teeth have more severe problems such as hooks, or uneven wear conditions called “step mouth” or “wave mouth”, motorized dental tools are used to restore a smooth grinding surface. As you might guess, sedation is usually necessary to get a horse to allow such procedures to be performed. Restraining stocks and special equipment to hold the mouth open are also used. Young horses often have small teeth left over from their prehistoric ancestors that are called “wolf teeth” because they are much smaller than the horses other teeth and are about the size and shape of a wolf or a large dog’s tooth. They can cause problems in bit training because the bit can pinch the gum up against the wolf tooth causing pain. For this reason these unnecessary teeth are often removed by the veterinarian before training begins. If the other teeth are sharp on the surfaces near the bit, the veterinarian can also smooth out their edges to prevent gum irritation by the bit. This is called a “bit set”. So to keep your steed in tip-top shape, don’t forget his mouth! He’ll thank you with better use of that expensive feed, less belly aches, and less problems with the bit. He might even give you a big grin and a horse laugh, too! 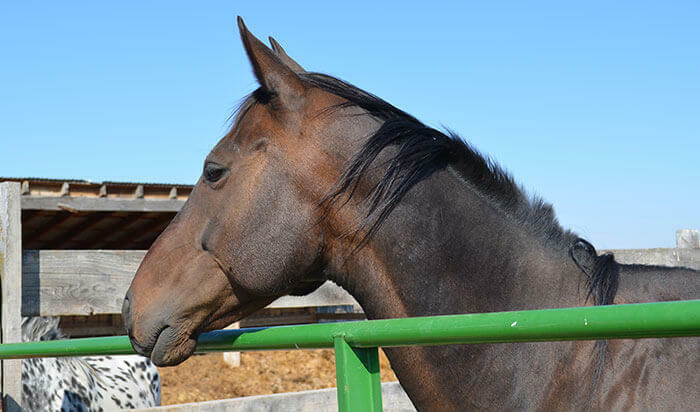 Upper Valley Veterinary Clinic in Rexburg, ID is ready and able for any equine dental work. If you have questions about our pet dental services, or need to set up an appointment, please give us a call at (208) 356-4271.